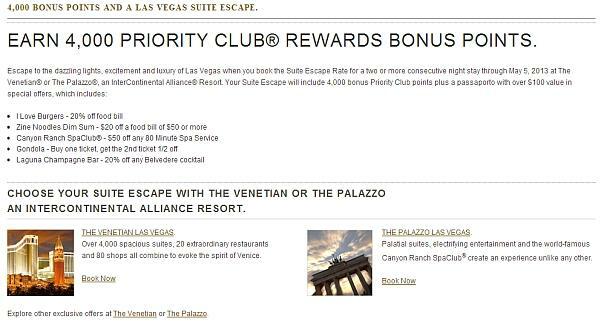 Priority Club has a bonus offer for booking a minimum of two nights stay at Venetian or Palazzo, both part of InterContinental Alliance Resorts, using Suite escape rate by May 5, 2013. You can access Priority Club’s web page for this promotion here . The rate code for this offer is ISSEP. There seems to be a one night deposit requirement for this rate, but it is cancelable up to 3 days before arrival. Check the rate rules! Remember that you only earn the 2000 base Priority Club points at the InterContinental Alliance resorts regardless of the room rate you pay or for food and beverage charges that you incur during your stay. The Suite Escape rate is the same as the Best Available Rate (BAR) for the dates in April. There were no discounted rates available on Priority Club’s website. If you are going to Las Vegas during the promotional period and booking one of these two hotels, you may consider booking this Suite Escape rate and collecting the bonus points along the way. Must complete stay by May 5, 2013 to participate in Suite Escape promotion and receive special resort extras valued at $100. Exact added values and/or terms & conditions are subject to change without notice. The Resort Extras to be provided during check-in. Must book a minimum two (2) consecutive nights and be a Priority Club® Rewards member or enroll prior to stay to be eligible for the 4,000 bonus points. Guests must book their qualifying reservation through IHG channels (brand websites or call centers). Suites are available only at participating InterContinental Alliance Resorts, The Venetian® and The Palazzo® in Las Vegas. Must be 21 years of age or older. Offer is based on single or double occupancy and added charges may apply for additional guests. Blackout dates do apply. First night’s room and tax deposit required, and is fully refundable if cancelled at least 72 hours prior to arrival. Rates are non-commissionable to travel agents. Subject to standard Priority Club program terms and conditions. The Venetian and The Palazzo management reserves all rights. I Love Burgers: Cannot be combined with any other offer. Valid for parties up to 8. Tax and gratuity not included. Present voucher to redeem. Zine Noodles Dim Sum: Dinner reservations required. Must mention coupon at time of booking. Not valid with any other offers. 18% gratuity added to bill. Canyon Ranch SpaClub: Not Valid with any other offer. Must be 18+ years old. No cash value. Gondola: No cash value. Not valid with any other offer. Not valid on previously purchased tickets. Based on availability. Laguna Champagne Bar: Redeem at Laguna Champagne Bar. Limit four cocktails at promotional price. Valid one time only. Must present voucher to redeem. Not valid with any other offer.